With a view straight out to the mouth of the River Dart, Flat 1, 8 Mount Boone takes some beating. This apartment is located on the ground floor of an imposing Edwardian house, retaining some of its original features. From the spacious sitting room, the French doors open onto a terraced area, and then from there down into the level garden. The garden is a special feature of this property, having been carefully planted and lovingly maintained with an extensive range of shrubs and herbaceous plants. The kitchen/dining room is a sapacious, well equipped room, having a lovely Aga to do your cooking on. The property has 2 bedrooms, one of which is a double room and is located at the front of the house. Flat 1, 8 Mount Boone also has off road parking, a rare find in Dartmouth. 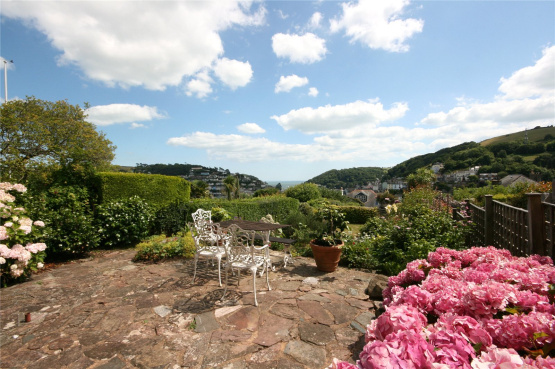 Kirsty Cook, Sales Manager, Dartmouth said: "Flat 1, 8 Mount Boone is a fantastic Edwardian apartment, with incredible views down to the mouth of the River Dart, and could be either a permanent home or an ideal lock up and leave." Flat 1, 8 Mount Boone is offered for sale at £410,000. For further information please contact Marchand Petit’s Dartmouth office on 01803 839190, email dartmouth@marchandpetit.co.uk.